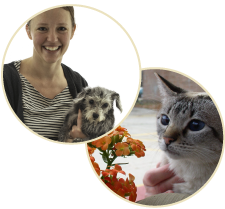 Dr. Erica Hellestad obtained both her undergraduate degree (BS Animal Sciences) and DVM at the University of Wisconsin-Madison (DVM 2011), but has been with Whole Pet since 2008. She is originally from Elkhart Lake, WI but has called Madison home since 2003. Erica has strong interests in nutrition, behavior and preventative medicine. She is also very interested in complementary medicine and has seen first hand the benefits of combining both Western and Eastern medicine in her own pets. She is a member of several veterinary associations including the AVMA and the WVMA. Erica also supports animal rescue and has volunteered with numerous Spay Day events. Erica and the very tolerant Brendan share their home with 4 adopted dogs (Rigby, Murphy, Keela and Lena), 2 naughty cats (Wilson and Monkey) and last but not least, various fostered pets who find their way into their home for short or long stays. Brendan and Erica enjoy canoeing and camping with the dogs and recently braved a boundary waters trip with the dogs! They also enjoy attending Badger sporting events, listening to live music and exploring the beautiful Wisconsin outdoors.